Who would use virtual organizing services? Why would you expand your business to included this service? There are probably as many ways to do virtual organizing as there are organizers. Here are 2 formats. To keep the process simple, only one room will be discussed at a time. Book a Virtual Appointment using Skype, Face Time, Google Hangouts or Facebook to see the room and discuss the client’s organizing goals. After they have had time to read the plan, book a virtual question and answer session to allow the client to clarify the plan and establish a timeline for the project. Once a timeline has been established for the project one of two follow up options may be selected. Support Option A – This works well for people who manage their time well and are motivated to get the job done. receive donation and recycling information. Support Option B – This works well for people who are easily distracted or procrastinate in getting the space organized. The client will e-mail the day and time they will be working on the job. You will e-mail, Skype, text or call each hour to see what assistance they need in order to successfully complete the work scheduled for that day. In Format 1 most of your time is spent on the process of building the customized plan. Set limits on how long the Intake Conversation, Virtual Appointment and Virtual Q & A will last. The billing for the plan will include the time spent on the 3 conversation and the time to write the plan. You will also be billing for support options. You may want the client to pay a retainer that covers a specific number of minutes or hours. If they need a lot of support they can purchase additional retainers. If they don’t use all the minutes they purchased, reimburse them. Format 2 for the Body Double Clients = This process is very similar to working with the client in person. After the client contacts you, book an intake conversation over the phone, Skype or e-mail to describe the process to the client. Have the client send you photos or a video so you understand their situation clearly and to use them as reference. Book a Virtual Appointment using Skype, Face Time, Google Hangouts or Facebook to see the room and discuss the client’s organizing goals and begin organizing. You will be on your computer for the entire length of the appointment. You will be their body double teaching them skills, keeping them focused and supporting them. Coach them through the process of sorting, reducing, establishing a space to store things, containers to use and evaluating if they met their goals for the session. The sessions may include: where to donate items, how to sell items, where to recycle items and any services you would like to include in the package. Book the next appointment and continue working with the client until the job is completed. Billing for Format 2 is simple. Determine what your virtual organizing hourly rate is and bill them for the number of hours you worked together. 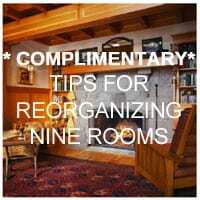 You don’t need to limit your virtual organizing to rooms. I have done a virtual time management session with a client. If you want to discuss these formats, contact me and let’s learn from each other. You have clearly spent a lot of time developing and refining your system – this is excellent! I tried virtual organizing in the early days of my business, but we didn’t have video conferencing back then, so it was fairly limited. So much is possible now! When I went to the POC Conference in 2017 and listened to Sarah Buckwalter’s presentation and I learned a new system for doing virtual organizing that was much different than mine. I would love to learn how other organizers do it and how clients like to work virtually. I offer virtual organizing. I find I have the most interest from existing clients who relocate. Admittedly, I haven’t been assertive in promoting this aspect of my business. Love what you’ve put together! I have my first client to move away so I did offer her virtual services for the future. Thanks for the reminder for follow up with clients about working virtually.